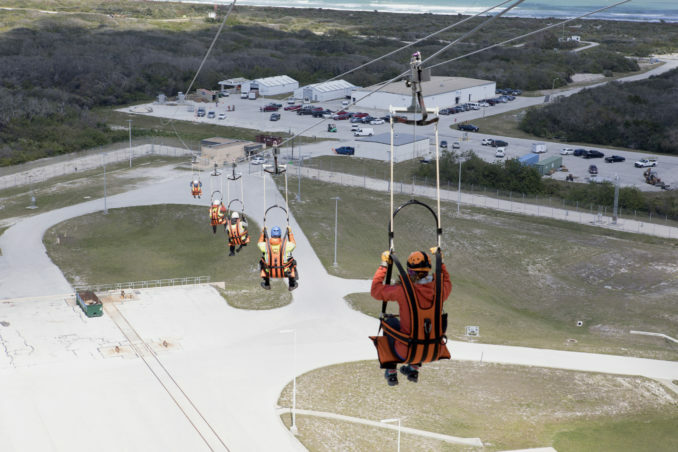 CAPE CANAVERAL — Ziplines are used by thrill-seekers in adventures around the world, but now they are coming to the U.S. space program as the emergency escape system for personnel at Cape Canaveral’s Complex 41. Watch video of the zipline testing at Complex 41. 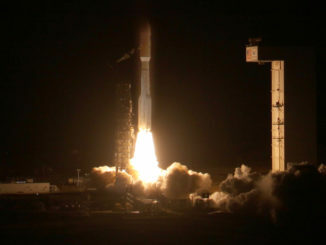 ULA is the launch provider for Boeing under NASA’s Commercial Crew Program that aims to restore the ability to launch astronauts from U.S. soil. Two test flights of Starliner capsules are planned in 2018 before NASA certifies the craft to begin ferrying crews to the International Space Station. 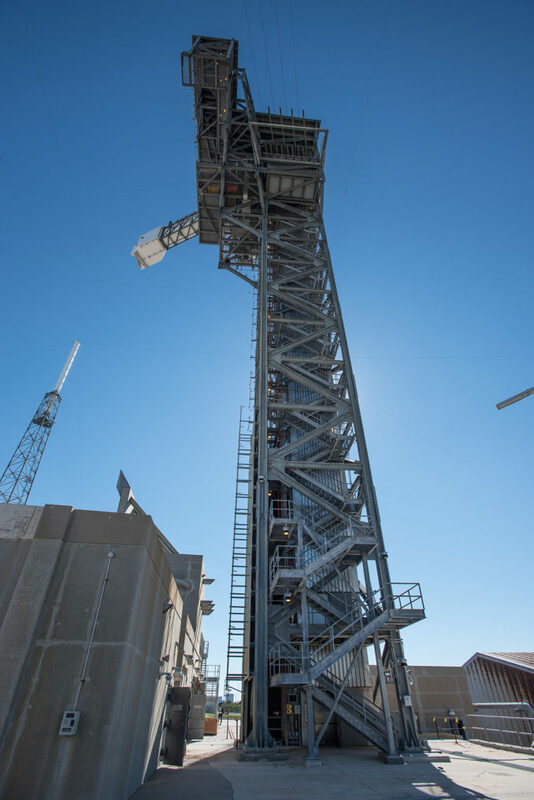 The new tower at Complex 41 was built in sections off-site, then the pre-assembled pieces were stacked at the pad in between on-going launches of the busy Atlas 5. Final outfitting work is underway now. Although extremely unlikely to ever be used, the gantry needed a method to whisk pad workers and the astronauts to safety in the event of a serious problem, similar to the underground “Rubber Room” used during Apollo and the slidewire baskets in the space shuttle era. See our previous pictorial on the Rubber Room. The solution ULA devised was ziplines to escape from Level 12 on the tower at top speeds of 40 mph. 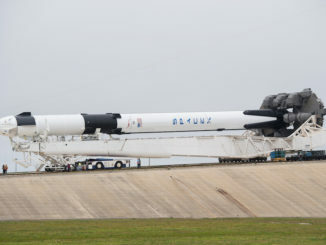 Each person evacuating will use patented “ZipRiders” adapted for the pad, essentially sitting in chair-like harnesses to travel along cabling in just 30 seconds to a spot 1,340 feet away from the rocket. Emergency vehicles will be pre-positioned in the landing zone for the personnel to flee the complex. “Through our partnership with Terra-Nova, a company that designs and builds ziplines for recreational use, a modified, off-the-shelf product has been designed and constructed to meet our needs and reduce costs, while maintaining reliability and safety,” said Wentz. The system can accommodate up to 20 personnel. 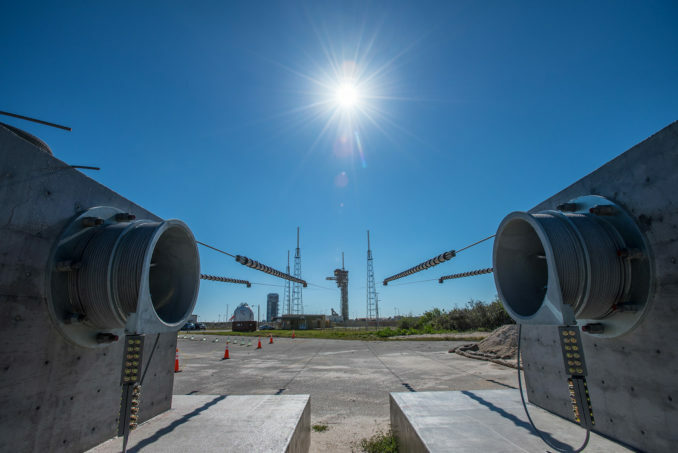 “Crew safety is paramount, and the ULA emergency egress system hits the mark for an effective yet simple system that is adapted from other commercial applications,” said Chris Ferguson, Boeing director of Starliner Crew and Mission Systems and a former NASA astronaut. 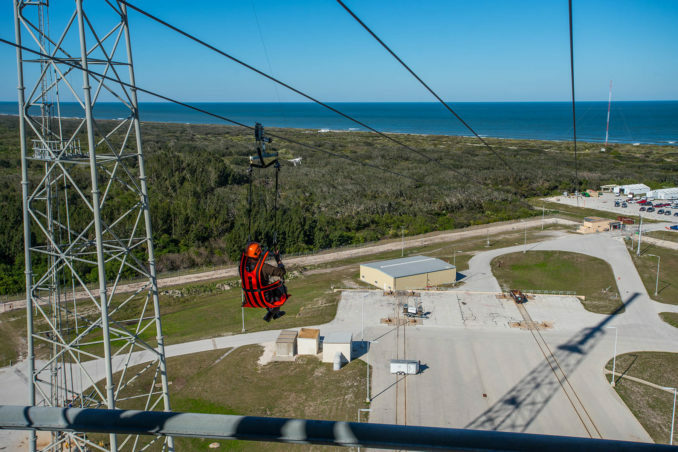 The ZipRider allows a user to control their speed with brake handles and make a gentle stop at the landing zone. But there’s also springs on each cable for braking. 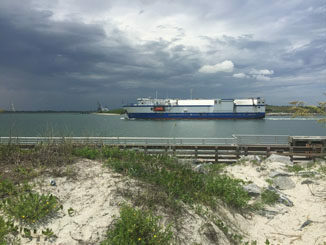 Terra-Nova will install a training system located north of the crew tower for riders to practice on before final training on the operational emergency egress system.